It’s no secret I am a garlic bread lover! You might think this is a little odd but sometimes when I was a freshman in college I would eat it for breakfast! haha My roommates thought a was a little weird but I got one of them to join in with me. We eat Christmas Eve dinner every year with my in-laws. This past year they asked us to bring the garlic bread to go with the lasagna. I thought about making my own french bread and garlic mixture but just didn’t have the time for it. So I went to Walmart to just pick some ready-to-go garlic bread. Well don’t you know that Walmart is super crazy on Christmas Eve! I survived shopping there, just me and my 2 boys but they only had french bread. So I made my own mixture to go on top. I found the recipe from A Sweet Pea Chef and I just slightly changed it. It’s so easy! Butter salt, pepper, parsley, parmesan cheese and of course garlic! Spread it on top. There is just enough to spread evenly. Which is how I like it. I feel like the store bought garlic bread has way too much butter. Broil it and it’s done! This is SO much better than store bought! I will never buy garlic bread again. In a small mixing bowl, combine all the ingredients except for the bread to make a paste/spread. Using a flat knife or spoon, spread the butter mixture evenly over the non-crusted portion of the bread. Sprinkle with additional grated parmesan if desired. Set both sides of the bread, spread-side up, on a baking sheet lined with aluminum foil and place in the center of the oven under the broiler until the butter is melted and the top starts to becomes golden brown, about 3-5 minutes. Take care to pay attention to the bread so it does not burn — it can cook quickly under the broiler. This looks so good! 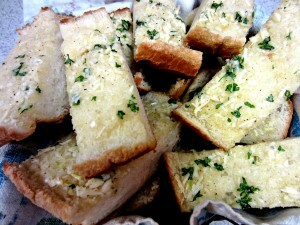 I love garlic bread too and could seriously eat an unhealthy amount of it! Yours looks wonderful!!! Thanks Maria! Garlic bread is the best!